1. Solid waste in Singapore has increased six-fold over the past 30 years. At this rate of increase, we will need to build a new incineration plant every 5-7 years and a new landfill the size of Sentosa Island every 25-30 years. This is not sustainable. Singapore has therefore adopted a waste minimisation and recycling approach as a long-term solution to address the solid waste problem. 2. About half of the solid waste in Singapore comes from households and the amount is increasing with more people and rising affluence. More waste from households also means that each household has to pay more as refuse collection and disposal cost will increase with growing volume of waste produced. We need to reduce waste from households by promoting recycling. 3. The National Environment Agency (NEA) launched the National Recycling Programme (NRP) in April 2001 to HDB and landed property estates to provide the residents a convenient means to recycle waste. In the NRP, the appointed public waste collectors provide recycling bags or bins to households to put in their recyclables such as paper, metal cans, plastic and glass bottles and clothing and collect them every fortnightly on pre-determined days. 4. The NRP does not include condominiums and private apartments as these private estates have their own Management Corporations (MC) and Managing Agents (MA). The decision to provide recycling service to residents rests with the MC and the success of a recycling programme depends very much on the planning, management, monitoring and communication of MA. NEA is encouraging MC and MA to introduce recycling programme in their estates so that residents in the estates have the opportunity to participate in recycling and play their part to reduce waste. 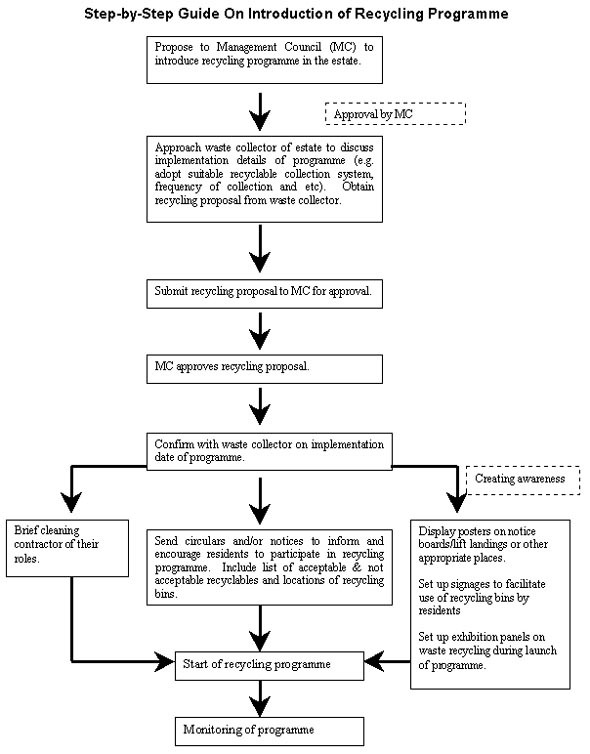  Table the proposal to introduce a waste recycling programme at the meeting of MC to seek approval from MC. Seek help from NEA to prepare information paper if needed.  Upon approval, work with waste collection company/recycling company/cleaner to prepare a recycling programme.  Communicate to all parties (e.g. waste collector, cleaners, recycling company and residents) the new recycling programme - e.g. locations of bins, what can be put inside, who will collect, etc.  Publicity and awareness raising to rally support of residents - e.g. circulars and/or notices and display *posters, exhibition panels to create awareness, launch ceremony, children parties and contest, etc. Seek help from NEA for posters, educational materials, etc. - Ensure that recyclables put out by residents are brought to the designated collection points for collection by the recycling company. - Forbid the workers to remove recyclables from the estate (e.g. newspaper, drink cans, etc) and keep them for their personal gains. - Maintain the cleanliness of recycling bins. - Notify MA on any overflowing of recycling bins.  Bag system with designated collection points where residents can put their recycling bags out on the scheduled day of collection. * Posters and exhibition panels (loan without charge) can be obtained from NEA. Contact NEA's Education and Partnership Department at Tel: 67319211. Materials can be viewed at www.nea.gov.sg.  Provide an agreed number and size of recycling bins or recycling bags. 11. If providing a recycling programme is not explicitly specified in the ongoing waste collection contract or if there is still a long period before the waste collection contracts expire, MA can contact NEA and the waste collection company to discuss the introduction of a recycling system for the estate. Other recycling companies may also be brought in if the current waste collection contractor does not have the capability to implement a recycling programme. Possible collection systems for recyclables are described in paragraph 7 above.